Double Exposure Blackjack is a hugely popular game with new online blackjack players and is played with 8 decks of 52 cards. Double Exposure Blackjack differs in the sense that both the dealers cards are shown (exposed). Most rules from traditional blackjack apply however there are a few changes in some rules which are in place to compensate for the huge advantage players have in seeing both cards the dealer pulls. The house advantage based on the added rules highlighted above bring the house edge to 0.69%. 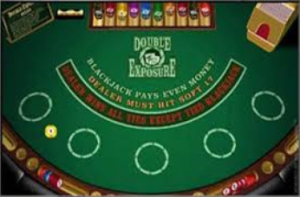 Double Exposure Blackjack allows its players to split any two cards that have equal value. However a player will only be dealt one card when splitting a pair of aces. Doubling is only an option if the player is dealt a 9, 10 or 11.